Henry Blaxton (shown in some sources as Blackston or Blackstone) (c.1545 – 1606) was Chancellor of Chichester Cathedral, who was appointed to the living at Cocking in 1574 which he retained until his death in 1606. It is doubtful that he spent much time in Cocking, as he appointed a succession of curates to minister to the needs of the parishioners. Little is known about Blaxton’s early years, although he was probably the son of Richard and Elizabeth Blaxton of Godmanchester, Huntingdonshire. He is first recorded as matriculating as a sizarNote 1 at St. John’s College, Cambridge in 1561. Blaxton graduated with a Bachelor of Arts in 1565, achieving Master of Arts in 1568 and obtaining his Bachelor of Divinity at Clare College in 1575. It is not clear when he was ordained, but his first appointment was in April 1571, when he was presented as rector of West Thorney, in the Diocese of Chichester. In April 1572, he was collated to the Wittering prebend at Chichester Cathedral and, in February 1573, this was followed by election as residentiary canon. At the same time, he became Chancellor of the Cathedral, retaining both positions until his death. He was collated as vicar of Cocking on 12 May 1574, replacing the recently deceased Sir Roger Wheler. Blaxton was married to Joan Nunn, with whom he had nine children: five sons (Henry, Godfrey, Joshua, Caleb and Athaniel) and four daughters (Elizabeth, Susannah, Sarah and Rebecca). Joan’s half-brother was Sir George Buck (1560 – 1622): Buck was educated by Henry Blaxton, firstly at Higham Ferrers in Northamptonshire and subsequently at Chichester. Buck was master of the Revels for Queen Elizabeth (where he was responsible for censoring the works of William Shakespeare) and wrote a biography of Richard III in 1619. Sadly, Buck was declared a lunatic and died at his sister’s home in Broadwater, near Worthing in 1622. Blaxton died on 30 August 1606 and was buried in Chichester Cathedral on 1 September. 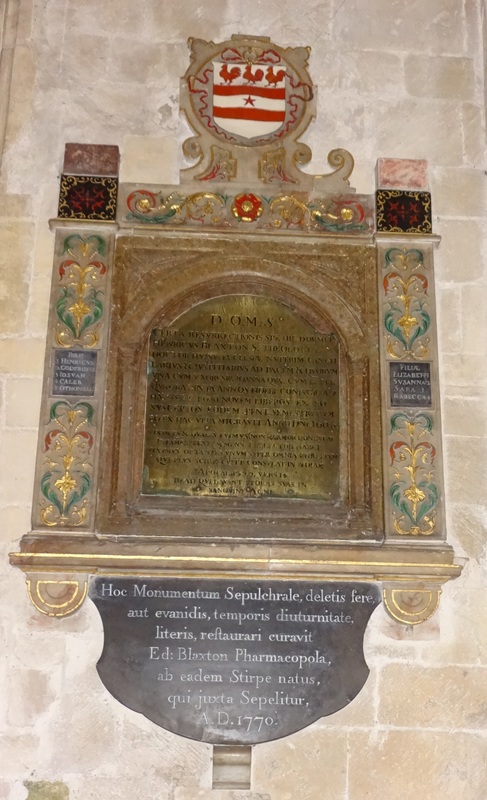 In the cathedral, on the wall of the south aisle, there is an ornate memorial to Henry Blaxton and Joan. The memorial is surmounted by the arms of the Blakiston family (from whom he was descended) and flanked by carved pilasters with the names of the nine children, in Latin. Two of the sons also became priests in the Church of England. Joshua attended Trinity College, Cambridge and was ordained at Canterbury in 1611, before being collated in 1613 as vicar at Wisbech in Cambridgeshire, near his father’s birthplace. Sadly, Joshua died two years later, aged only 33. Godfrey was the black sheep of the family. In 1596, he became the Rector of Rumboldswyke (¾ mile south-east of the cathedral). In 1600, he came before the Chapter of the Cathedral when he was told to cease his ‘Tippeling, vitteling and entertaining strangers by day and by night’, particularly at the house of George Mekyns, son of the parish’s former rector. (John Mekyns had been dismissed as rector of Rumboldswyke in 1555 for fighting.) In October 1630, now rector at Eastergate, Godfrey was charged with neglect of his duties and again summoned to appear before the Chapter. The verger had some problems in finding him and it was December before he eventually served the summons in the Crown Inn. Godfrey was declared “contuminous” and suspended from his duties. Godfrey had succeeded his father as rector of West Thorney in 1606 and, on his death in 1633, he was succeeded in turn by his son, Benedict. Henry junior was married to Philippa Cooper; following his death in 1609, she re-married, to Roger Andrewes, who had succeeded Henry senior as both Chancellor of Chichester Cathedral and vicar of Cocking. Henry Blaxton’s daughter, Elizabeth, married Gerard Peeters, who was a renowned classical scholar in the 16th century. No doubt because of his connections with Blaxton, Peeters gained various livings in the Chichester diocese, including prebendary for Hampstead prebend at the Cathedral, vicar of Poling near Arundel and rector of St. John’s, Lewes and at Plumpton.